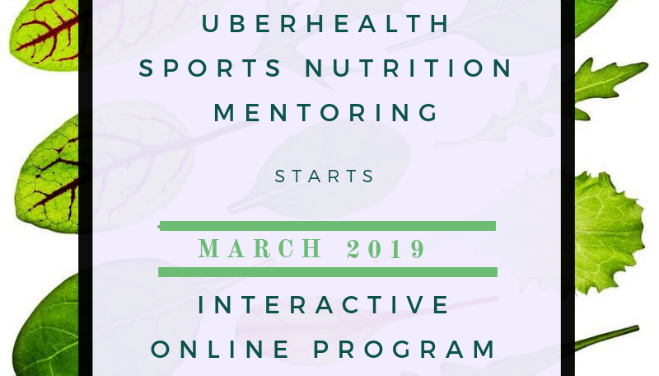 Over the last few years I decided to create a training platform that enabled students and practitioners to be mentored in sports nutrition via a ‘live’ group program. The success of these groups has seen me work closely together with people from all over the world. So far I have had students from Australia, New Zealand, UK, Germany, Singapore, Canada and the USA. I’ve noted many expressions of interest for another round of Sports Nutrition Mentor Training and so…. I use a video conference platform called ZOOM, so you can virtually come face to face with myself and everyone else in the group. It’s very interactive, with all participants being able to chat and ask questions along the way. Some months I present a case study, other months you can present case studies and we as a group will brainstorm treatment and food plans. The first month is a power point lecture and chat about the basics of sports nutrition so that everyone is on the same page of understanding and knowledge. It’s also up to the group which direction we go, if you have certain topics or sports you wish to focus on we can do that too. Each group I have run has been unique and will greatly depending on who is involved which make it all the more fun. A Facebook group has been created so students can chat throughout the training months and share resources, research, recipes that you may find. You might even like to ask specific questions about your clients too. All previous students belong to this group so there is a wide variety of knowledge and backgrounds to interact with and often you can get feedback form many different people. Audio, video and screen share recordings of each training will be available for you to review following each training in a dropbox folder. I also provide lecture notes for your reference. All information will be available for you to access and refer to at anytime. Classes will run on Mondays or Tuesdays, once a month, all times are Australian time and date. The program runs for a total of 6 months. One class per month for 1.5 hours. Please email me your preference so I can see what is wanted. This is either $80 AUD session or $70 AUD session depending on your status of student or practitioner. The class in total will be approximately 10 hours of mentoring plus questions in the FB group. At the end of the 6 months you will receive a certificate of completion and can use it for a total of 6 CPE points. Please be aware this class does not give you a diploma or specific qualification, it is a mentoring group and does not enable you to call yourself a sports nutritionist. Interested in joining the training? If you have any further questions regarding the training, please email me at kira.sutherland@gmail.com or just hit reply to this email. My phone number is +61413752858. There are just 10 spots available for each group so please let me know as soon as possible if you are interested. Previous Previous post: Minimalistic Health our Step One..